Autoroute 73...why is it numbered 73, and not 75? Does anyone know? I have attempted to find out in various searches, but have turned up nothing. 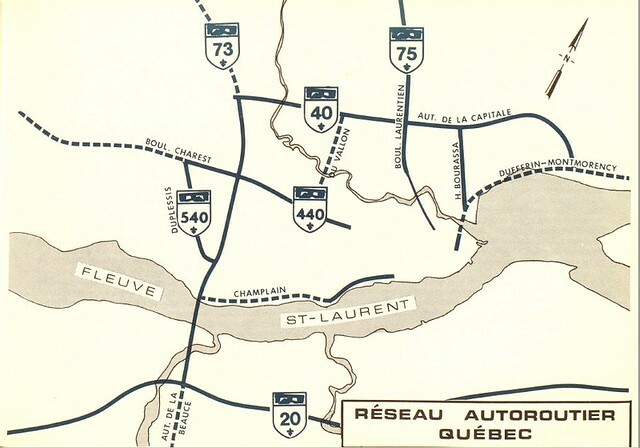 A-73 doesn't make a lot of sense, given that its predecessor route is QC-175, and following the pattern of other Autoroutes with predecessor numbers (A-85 and QC-185, A-55 and QC-155), it should have been numbered A-75. Additionally, there is no A-75, but A-73's location is exactly where A-75 should be. Does anyone know? This has been driving me a bit batty...and this is the only place I can think of where people may be geeky enough to care. South of Québec City, its parallel surface road is 173. Agreed, but it still is in the location where A-75 should be, and north of Ville de Québec, the parallel route is 175...so why isn't it numbered 75? The location alone (being where A-75 should be) should allow for the number of 75 (and with 175 present, too)...Quebec is very methodical as to how it numbers Autoroutes, so 73 just seems wrong. Perhaps an official who has influence over the choice of A-numbers is an amateur radio enthusiast. A-73 from the USA border to the Pierre-Laporte bridge to Lac St-Joseph along what is now the A-73/A-573 route. A-75 from Quebec City downtown to the North along the current A-973/A-73 route. At some point before any of those autoroutes were actually numbered, the plan changed to a through North-South autoroute that would combine the planned A-73 and A-75. For some reason, the number chosen for the combined route was A-73 instead of A-75, and that bit is still a mystery to me. But the basic reason why we have A-73 today is that A-75 was also in the plans but eventually scrapped. I have some documents to support this that I can post later. I would love to see these documents! The Quebec Autoroute system has always fascinated me, as it is the closest thing Canada has to the Interstates, plus when I visit Quebec, I really do feel like I'm in a different country -- I've never felt that way in either Ontario or New Brunswick (though I do like Harvey's, Kelsey's, Mr. Sub, and Swiss Chalet ). There you go. The first map is from a 1972 activity report of the Ministry of the Roads, the second map is from a 1973 activity report of the Ministries of the Roads and Transportation (some administrative shuffling happened in 1973). According to the official maps, actual numbering of the A-73 was in 1974 or 1975, so I doubt that A-75 shields were ever seen. Thanks for posting these...they're interesting. I'd really like to know why A-73 was chosen instead of A-75...it just makes more sense, as A-75 better fits into the grid. And so are the 400-series highways in ON. As to the subject at hand, I never gave A-75 much thought, but I think it would've been a better choice for the reasons listed in the OP. But A-73 works well too. 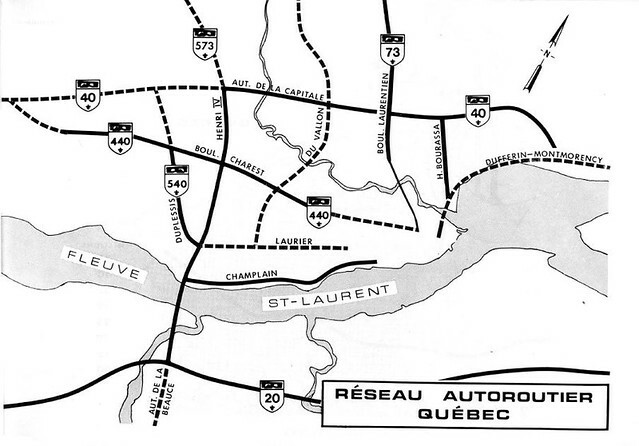 On a similar note, you might wonder why A-35 is not A-33, as QC 133 is the parallel road for it. Ever driven NB1 and TCH2 through New Brunswick? Based on the original numbering, there's not a lot of 75 north of QC, but plenty of 73 south of it, so they probably chose that as the predominant number. With no plans to fully upgrade 175 to Autoroute, 73 is fine with me. Makes the system more interesting, too. Given A-55 and A-955, I'd just slap A-73 shields down all the way to Saguenay even without upgrades in the park (though if they did that the portion in Saguenay to A-70 should be upgraded). Anyone think A-73 will be extended to ME 6/US 201 at the border? Or is that even worth it? I doubt it. Traffic on the Quebec side thins out south of St-Georges, and it's also pretty light on the Maine side of the border. There seems to be ROW set aside for a possible short extension south to complete the bypass of St-Georges, but I expect such an extension would stop at route 173. A-73 won't be extended to the border unless Maine builds an expressway down to I-95. Otherwise, you'll have a reverse I-89 situation that would take years to correct. I think he was referring to freeway systems, not individual freeways. Indeed, NB is the only province right now that has the Trans Canada completely freeway. Or NB 1 to US 1. NB 1 is freeway, and it ends at US 1 in Calais ME, which is 2-lane. It doesn't make sense to make US 1 freeway there either. .........ndeed, NB is the only province right now that has the Trans Canada completely freeway. Not completely freeway yet. The 52 km section of TCH16 between Aulac and the Confederation Bridge is 2-lane. I was thinking about the main route (TCH2) through the province. US 1 doesn't end there, though. It bends around and heads north and eventually northwest to Fort Kent. Extending the I-395 freeway from Bangor along the ME 9 corridor to connect to NB 1 has often been considered, and would make for an easier connection for those heading to Nova Scotia and Eastern NB. Yes, I was thinking of freeway systems. The Autoroutes are virtually identical to the Interstate system, just covering a much smaller area. I was in Montreal a few weeks ago and it was so fun to imagine me driving on those numbered highways being interstates, and thinking of where they intersected (if they do at all -- there is no intersection between I-30 and I-15, but A-30 and A-15 do connect). I actually remember saying how similar the shields looked to my dad when I went there in 2009. At the time I recognized Interstate shields (probably from movies and whatnot) but wasn't into signs or roads at all. That was the point of their design I suppose.